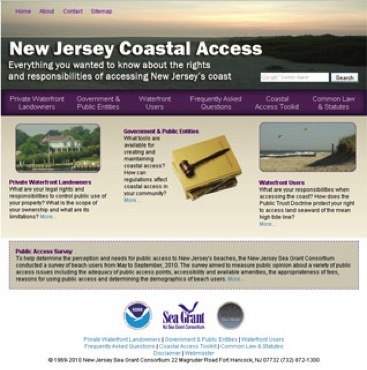 The New Jersey Coastal Access website offers legal information and tools that address coastal access issues and enables New Jersey’s waterfront users, coastal communities, and land owners to deal with those issues cooperatively and hopefully without litigation. The project was funded through a mini-grant from the National Sea Grant Law Center. While the site helps users understand how the law might apply to their situation it does not provide legal advice, which is the application of law to someone’s specific circumstances. The site is monitored and updated regularly to reflect the frequent changes in legal rulings and state regulations affecting public access.